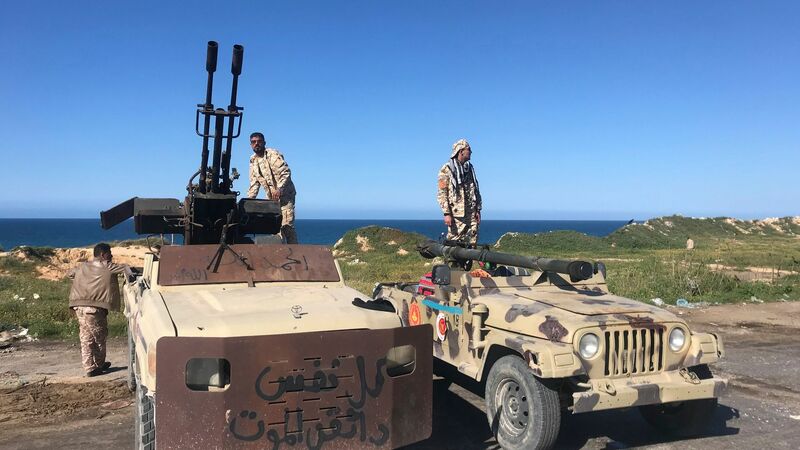 Forces loyal to Khalifa Haftar, the warlord who already controls eastern Libya, are nearing the country's capital of Tripoli. The latest: At least 51 soldiers and civilians have been killed in clashes between Haftar's Libyan National Army and militias loyal to the U.N.-backed government. Thousands have fled. Thousands more are now trapped, and Haftar's forces today hit the airport with an airstrike. The backdrop: Libya has been plagued by violence and power struggles since the fall of Muammar Gaddafi in 2011. Haftar was at one point a top general under Gaddafi but later worked to topple him. He "is expected to face stiff resistance from powerful militias from the western cities of Misrata and Zawiya," per the AP. "Both the U.N. and the U.S. insist that a political process — not a military clash — is the only solution that will give Libya a lasting peace and functioning government," per NPR. "Many foreign powers involved in Libya have tolerated or encouraged the general’s machinations," the Economist notes. "France hopes he can bring other militias to heel. Egypt and the United Arab Emirates (UAE) share his anti-Islamist politics. Russia has also sold weapons to General Haftar. All mistakenly thought they could control him, not least by threatening to restrict oil exports, and prevent the opening of a western front in Libya’s long-running conflict."